Maybe you have heard about business coaching but you weren’t sure how a professional in that field could help you maximize the development of your company, whether you have a startup or one that is farther along. “Business coaching is an individualized process, with accompaniment for each business. Certain questions are used to help the business owner determine where the company stands, what are the goals, and what actions should be taken to achieve them,” said Nerma Albertorio, a certified coach, expert in marketing and president of 100 Ventures Business Accelerator*. As the owner of a company, you are the expert and know your product. However, the reality is that you need a support group that pushes you to achieve the proposed goals. “The business coach sees the reality of the company from another angle. Just as athletes have trainers and singers have voice coaches, a business person needs someone to provide support,” said Albertorio. Business analysis: Examining the financial statements. Marketing strategy: Asking the right questions so the owner identifies the company’s audiences and possible allies. Professional counseling: Work with a business psychologist to manage conflicts and reduce work stress levels. Among the tools of business coaching is the Business Model Canvas. This provides a series of key questions to discuss with your coach. The tool helps you understand what you need to carry out your business plan. 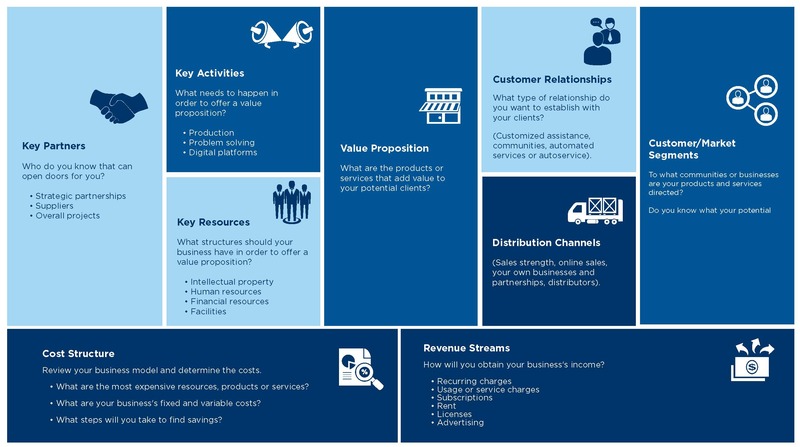 The Business Model Canvas is shared below. Answer the questions and review the areas where you need the help of a coach to make the most of your business. Making decisions that are wise and timely. For example, deciding how and when to sell or expand the business. Conflict resolution. Albertorio has worked with family-owned businesses that have stalled in their development because the owners do not delegate or do not trust the next generation. Working with the psychologist, the business person can manage these and other issues that create a lot of efforts and family conflict. Hiring qualified personnel and training current ones. Through coaching exercises, the business owner learns the importance of providing employees with tools that enable them to do their work. Creating a new business model. Some owners launch a business without a well defined plan. When you begin operations, however, you should already know whether your goal is to leave the business to your children or if you will sell it in a few years. You should also recognize when is the right time to increase earnings through strategies such as developing franchises or new products. Promoting creativity. The coach’s questions will help you discover new ways of doing business. Alliances with other business people. The coach works with other businesses and encourages activities that provide openings to build ties with the owners of companies both in the same industry and in others. Balance between personal and professional life. Learn techniques to separate the two spaces. This aspect is very important, particularly in family-owned businesses. Take action and add the services of a business coach to your support team. It can let you harness the power of your business and achieve your goals. To learn more about how to develop your business, visit our Business Education Center. *100 Ventures Business Accelerator provides coaching free of charge to businesses that are part of the StartUp Popular financing program for new businesses. If you are a current business customer of Banco Popular, take advantage of this offer for a 25% discount on the cost of the services offered by 100 Ventures Business Accelerator. Make an appointment by writing to info@onehundredventures.com or by calling 939-251-5494. Offer valid until November 1, 2017.